When a fresh batch of Stracciatella arrives from Wolf Meadow, I immediately crave a big, sweet, juicy slice of tomato topped with the creamy ribbons of Stracciatella. My cravings won’t wait for summer tomatoes, so I had to come up with a way to winterize this beloved summer dish. I jazzed up grape tomatoes by roasting them, layered in a few lasagna noodles with the Stracciatella, and sat down to a hot, bubbly, winterized Caprese. Craving cured. Enjoy! In a medium bowl, toss together the tomatoes, garlic and shallots with the olive oil, balsamic, sugar, salt and pepper. Spread on a baking sheet and roast for 15 minutes at 425 degrees. Then turn the broiler to hi and broil for another 10 minutes, or until tomatoes are blistered and slightly charred. While the tomatoes roast, boil the lasagna sheets until al dente -even if the package is ‘no boil’ noodles. 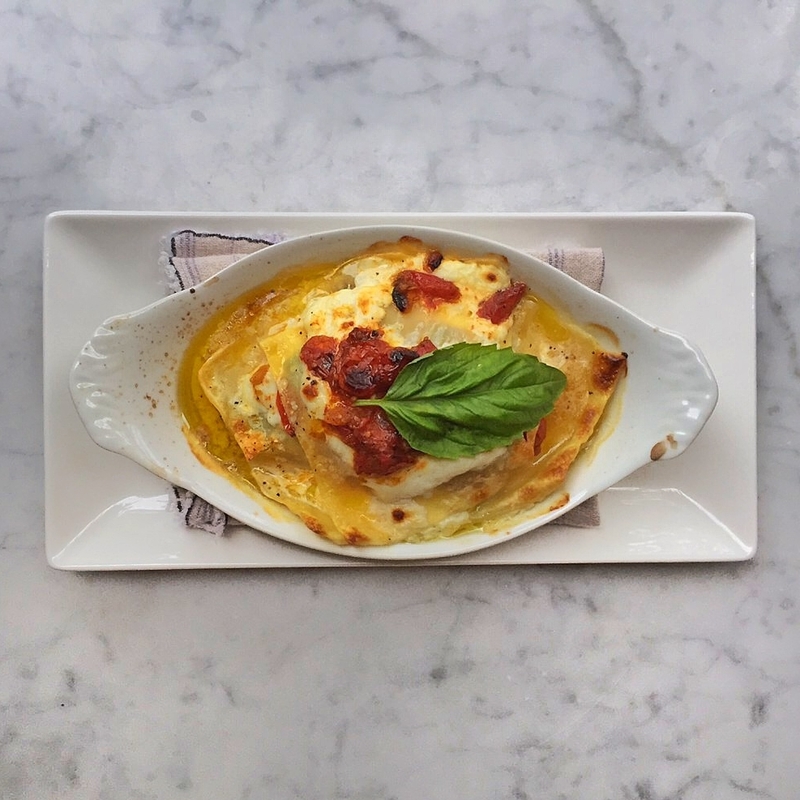 In a small baking dish (or individual size baking dishes), about the size of a loaf pan, assemble by layering one sheet of the noodles, a spoonful of stracciatella, a spoonful of tomatoes, and a drizzle of olive oil. Season each layer with salt, pepper and basil. Continue this for a total of three layers, ending with tomatoes (reserve basil for final garnish after broiled). With the broiler on high, broil for about 10 minutes, or until bubbly. Can be made ahead and stored in the refrigerator up to 3 days. Reheat at 400 degrees for 20-30 minutes.